Good afternoon! Monday Motivation has now moved to the middle of the week for some Midweek Motivation! So, I’m not sure if it’s the change of the season or my lack of sunny sunshine, but my patience has definitely been running low among business and personal happenings. By nature, I’d like to think that I have plenty of patience and easy-going positive attitude but my patience does run out! We all do, don’t we!? The things I’ve learned is that it’s pointless…pointless…POINTLESS to have patience when your attitude inside is negative and resentful of having to be patient. 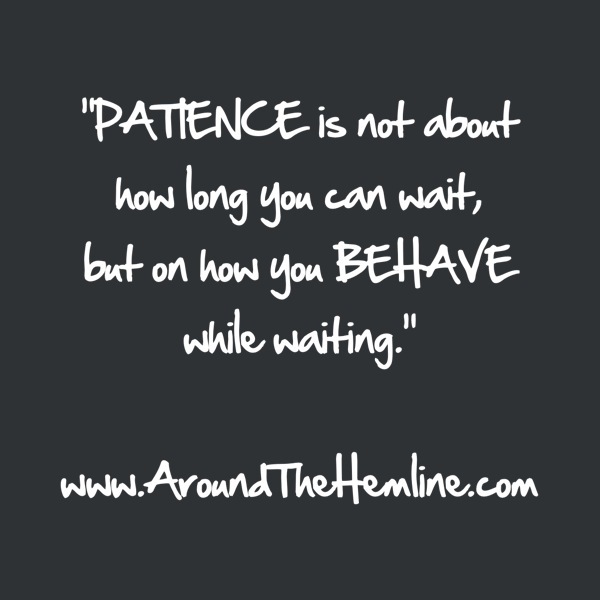 The bad attitude (or behavior) negates the wait. When we wait for things to happen, we must let it flow naturally and the end results comes as they should. I know there are times where I want things to happen so badly and I get irritated, anxious and almost unreasonable when they don’t. But I do know that once I’m over the ‘shock’ of it not happening, I let it flow, find other means of making it happen and I wait patiently until it happens. Sometimes the first time wasn’t the right time or the right approach. Never force it to happen. When things don’t happen the way I planned, then it truly tests if I continue to want it. Do you still have the patience and perseverance to keep going?! If not, then the cosmic world was right, it shouldn’t have happened. The important lesson is just to be on ‘good behavior’ but still have the drive to let it (whatever it may be) come as it should! Have a great week ya’ll!